I started college in 2015 at Piedmont Technical College, one of the few in the United States that offered a dedicated gunsmithing program. 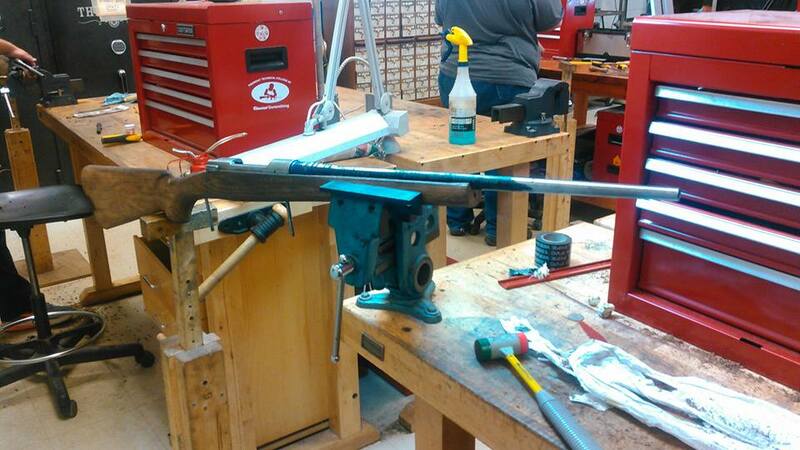 One of the big projects in the program was that each student would build their own custom rifle from a Montana Rifle Company action, Green Mountain barrel, and hand-carved stock. It would be our first custom build for many of us, and was to be our resume to find work after graduating from the program. In practice, it took about 6 months to build. The supplied action; in need of a barrel and stock. We were to turn, thread, and chamber our own barrels using rifled barrel blanks supplied from Green Mountain Barrels. 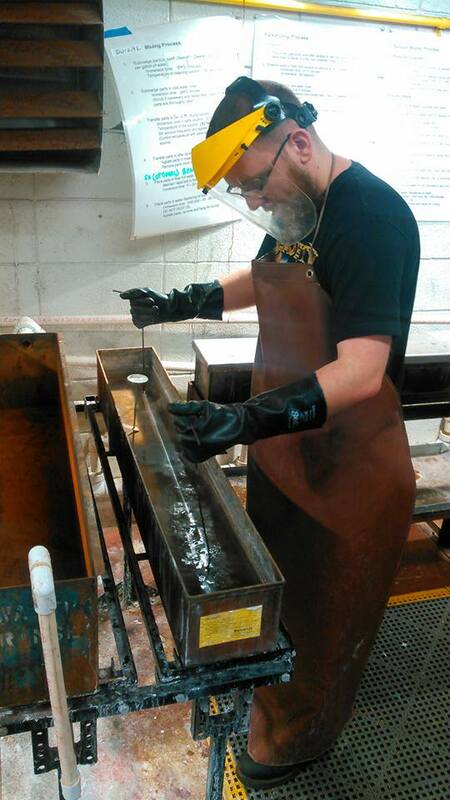 Before we worked on our live barrel (where mistakes could be costly or even dangerous), we started by drilling out a piece of bar stock and threading/ "chambering" it to learn the basics and get experience cutting a chamber so that a cartridge would headspace appropriately. The action now "barreled" with a faux barrel stub and checked with headspace gauges to confirm proficiency and understanding of the task. Once we passed the test and made it clear that we could do a safe and accurate machining job on a barrel stub, we were presented with our live barrels which we mated to the receivers. 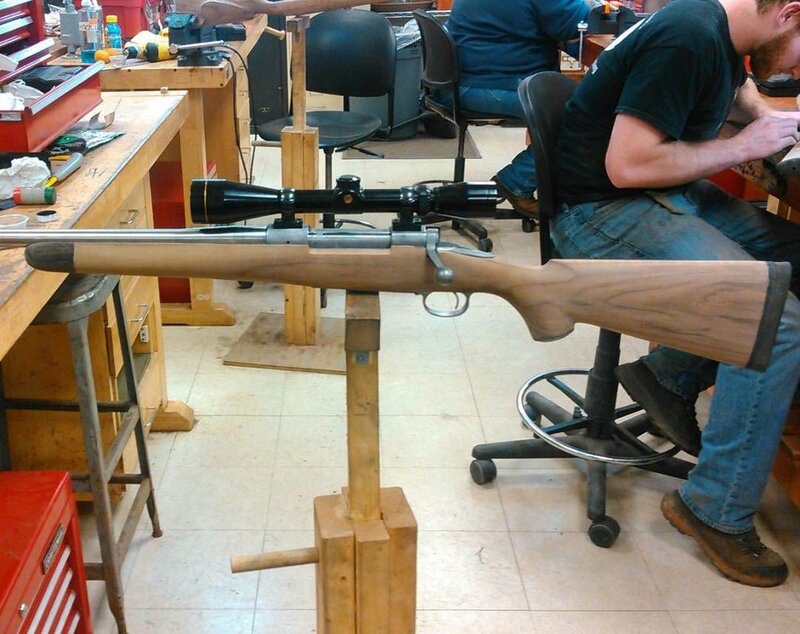 This was a great accomplishment and the first step of tangible progress towards completing our new custom rifles. We had been in school for two semesters, roughly 6 months, before we got to this step, and it was a very rewarding moment. The next step in the progress, however, would take an entire semester (months of work) of daily dedication to complete. The action had been barreled and technically the mechanical components were complete. We test fired the barreled actions with a single shot, confirming the function of the firearm. Next, the barreled action had to be fitted to our supplied stock blanks. We received our stock blanks in this condition - roughly shaped, but in need of lots of work to fit all of the components and finish by hand. 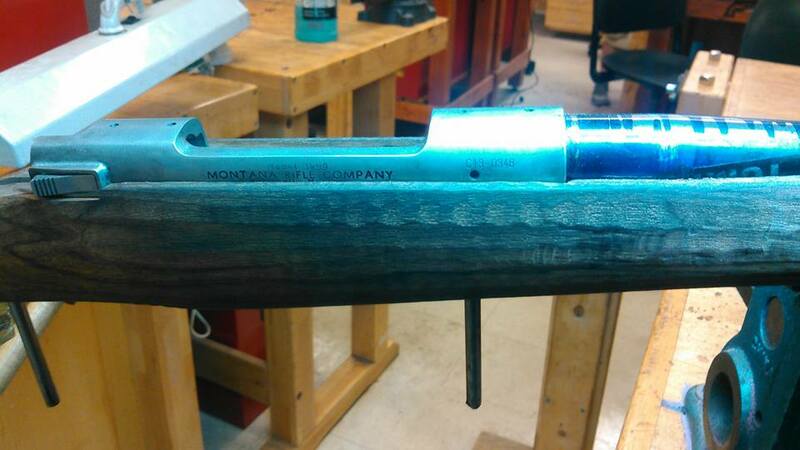 Dropping the barreled action into the stock for fitting. The process was very slow, as we were going for a perfect 1:1 fitment of the action to the stock. The metal components were painted with a transfer dye material known as "inletting black". These components were then carefully dropped into the wood, and settled with one or two very light taps. The inletting black on the metal would mark the places where it made contact with wood. It was in these places that we worked, slowly, carefully, removing little scratches of metal at a time. For heavier cuts, we used our swiss-made wood gouges, of which we had multiple profiles. These allowed the cutting (more like peeling) of larger amounts of wood in controlled action. As we got closer and closer to the dimension we needed, we started to transfer to wood scrapers. These tools would scrape away wood, little bit by little bit, to remove specifically where wood needed to be removed and leave a smooth finish. This process continued for weeks at a time, until our actions fit perfectly into the stocks. At this point, they were pillar and glass bedded for accuracy and repeatability. The action, mated to the stock. Bedding the action to the stock. A two-part epoxy is mixed and a release agent applied to the metal to prevent the action being permanently stuck. 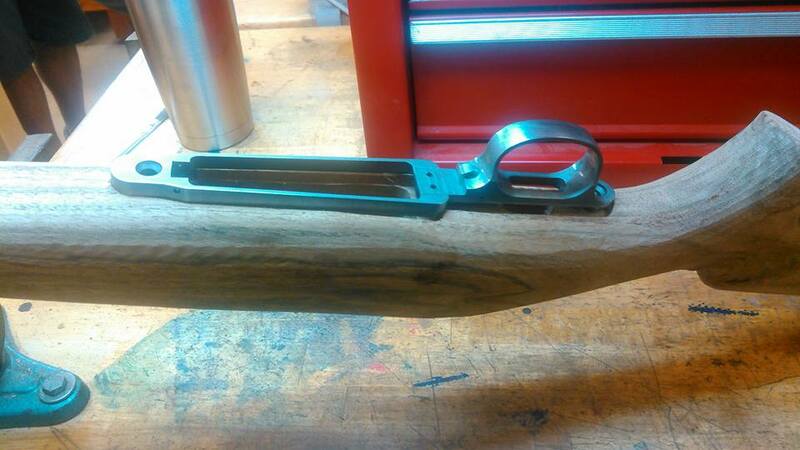 The epoxy is applied inside of the stock and the action clamped in place. As the epoxy hardens, it will mold to the imprint of the action and provide a solid, repeatable contact surface that is unaffected by pressure, heat, humidity, or other effects. I don't actually have more pictures from the shaping of the African Blackwood forend tip - but here is the process we used for lining up and squaring the stock for its installation. Once the action was fitted and bedded, it was time to finish the stock. We used rasps and planes to remove large patches of wood, removing the bulk and bringing it closer to final shape. We worked from stock templates and carefully cut features to fit us individually. I'm pretty short, shoot left handed, and have a very short length of pull. I made several significant changes on my stock to reflect this; reducing the size of the palm swell, lowering the comb for a better cheek weld, and cutting my stock to have a 14" length of pull with the recoil pad installed. Couldn't resist putting everything together for a picture. The stock here is shaped, sanded, fitted with all components, and ready to begin receiving its oil/polyurethane finish. The metal will require polishing before going to the hot blue solution. Wetting the wood with a little bit of water will raise the whiskers in the grain. These will be sanded down for smoothness and consistency of finish. It's also a great opportunity to bring out the contrast in the stock and see what kind of figure you'll be looking at with an oil finish. I got lucky with this one. To finish the wood, I polished my stock smooth using a flat backer (to avoid sanding waves into the wood) and working my way up to 1000 grit sand paper. We applied layers of finish by hand, allowing 24 hours or more to dry completely between coats. My rifle took almost 10 coats to get to the finish I wanted. The next part was to blue the metal (see my blog post about doing so here). Starting the chemical bluing process. Small Parts out of bluing. By polishing some small parts and holding them over a torch with careful timing, a range of colors from deep bronze to electric blue can be created. 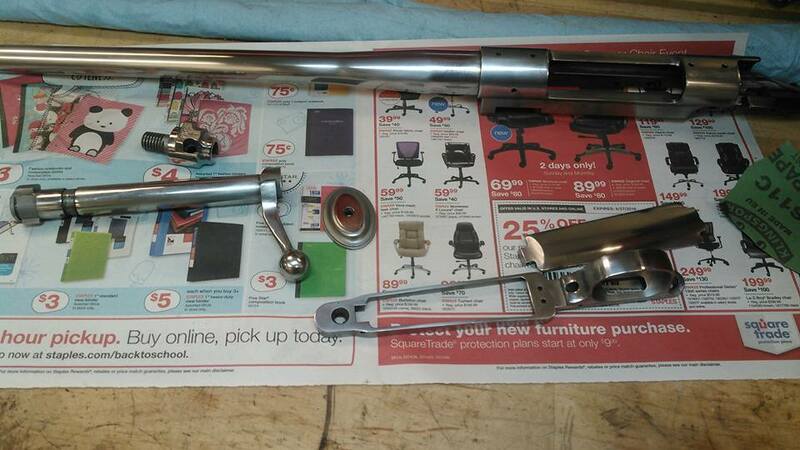 This was done on small parts such as the safety selector, action screws, and bolt stop. This process will be covered in more detail in a later blog. Although not captured well on my cell phone camera, the screws were tempered to a color I would describe as "midnight purple"
Close-up shot of the action re-assembled. The trigger has been taken to a deep bronze/gold color, the only color readily taken by flame since it is a stainless steel alloy. The creator holding his rifle. Despite the look on my face, I was very happy and proud at this moment. 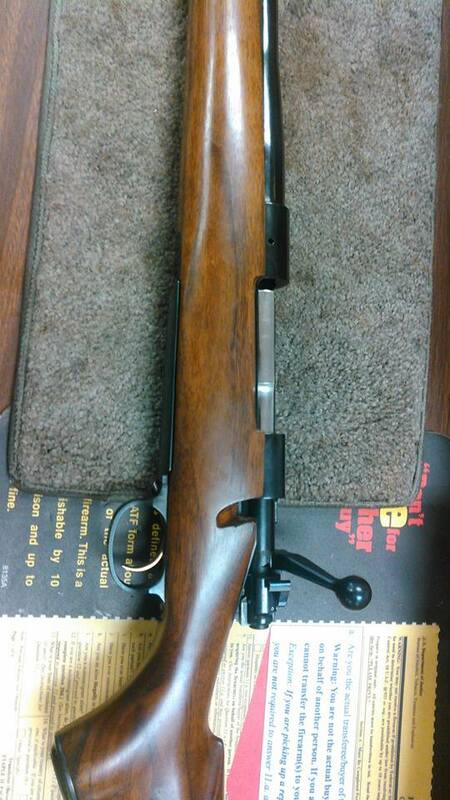 I knew I had completed a rifle that I would hold onto forever. At the range for sight-in. It managed groups right around an inch at 100 yards with Federal Power-Shok hunting ammo. To me, the process of creating the rifle with attention and purpose was one of the most fulfilling things I have ever done, and I am thankful both for having done it and for having the opportunity to share it with any who read this. I hope you enjoyed the insight and the process. Be sure to bookmark Potts Precision to see more projects (both mine and those of others). Also, follow the links at the bottom of the page to follow my YouTube and Instagram accounts to see more content on gunsmithing, shooting sports, and firearms technology. If you have a gun story you'd like to share, feel free to send it to dakota.potts@gmail.com or reach out to me here through the website to find out how to submit.